Description: Audrey bought some old dresses from a second-hand store. 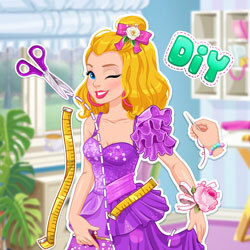 Help her upcycle them into fabulous new dresses for prom! We challenge you to put your creativity to work: cut and sew the material, tailor it, dye the fabric, apply ribbons and bows, belts and patterns. And don't forget to pick the perfect accessory to complete the look! Have fun.